The earth is our common home where survival and development are possible without the environment. But the environmental resources are limited and have certain technological discoveries, human needs are always growing. The earth cannot be made bigger and richer to supply our growing needs. On the one hand, our development activities should be enabled to continue in the long term. On the other hand, the future generations must get what we have got. So we must use the resources wisely, carefully and responsibly to let our coming generation live the comfort we lived. This is called sustainable development. Sustainable development means to take economic benefit what can help to raise living standard present generation without affecting the need for future generation. It means to conserve resources without affecting its quantity and quality. The main aim of sustainable development is to balance among the population, various resources, various aspects of environment and development. Sustainable development teaches people to make low use of means and resources. Sustainable development brings about changes in people’s knowledge, attitude and skill. Sustainable development emphasizes on the progress of health, education, agriculture, tourism and social reform for the development of human beings. Sustainable development aware the people for the involvement in the policy making for the concept of limit of development. What should be done for sustainable development? Tree plantation, preservation of the environment and forest should be done. Emphasis should be given to organic farming. Proper management of solid wastes should be done. Population growth rate should be controlled. Sustainable development means to take economic benefit what can help to raise living standard present generation without affecting need of future generation. The main aim of sustainable development is to balance among population, various resources, various aspects of environment and development. Sustainable development is the development process carried out with the wise use or responsible use of the resources that integrates necessary conservation efforts so that they can also be saved for future generation. Who produced the concept of sustainable development? Gro Harlem Brundtland, Prime minister of Norway who becomes the director general of WHO, produced the concept of sustainable development. On which principle does sustainable development base? Sustainable development is based on the principle of public participation. When was the concept of sustainable development brought? The concept of sustainable development was brought in 1963 with the publication of the Brundtland Commission Report. When was the Brundtland Commission Report published? The Brundtland Commission Report was published in 1987 AD. Mention any one practical activity that falls under sustainable development. Alternative energy development is a practical activity that falls under sustainable development. List out any six principles of sustainable development. What should be done for the proportionate development? The constitution has to clearly define and state that all the tribes and ethnic groups, linguistic or religious group are equal. The government should act strictly, sensibly and tactfully to fulfill the norms of the constitution and make things changed. Sustainable development implies that economic growth will have to become negative. Sustainable development is not necessarily incompatible with economic growth. Sustainable development is concerned solely with economic issues. Sustainable development is another name for economic growth. The term sustainable development was first used in 1980 by ______. The development in which not only the people but natural resources is taken care of as well is called ______. The main obstacle of sustainable development is because of ______. The first environmental conference of human environment was held in ______. 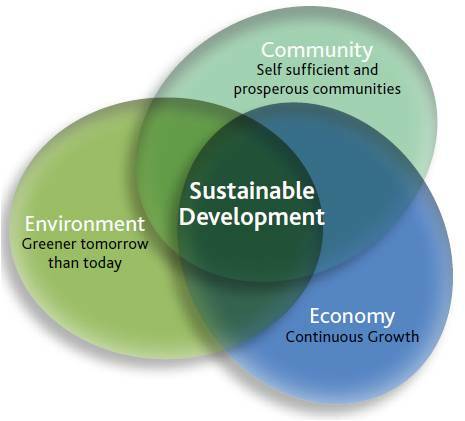 Which one of the following is principle of sustainable development? Which one of the following is importance of sustainable development? What should be done for proportionate development ? Any Questions on 'Sustainable Development '?